More than a few Grand Theft Auto imitations have hit the App Store in recent months. And while games like Car Jack Streets and Payback are pretty good at replicating the motorized mayhem of Grand Theft Auto, these apps don’t hold a candle to Gangstar: West Coast Hustle. Gameloft has really set the bar high with this near-console quality game. 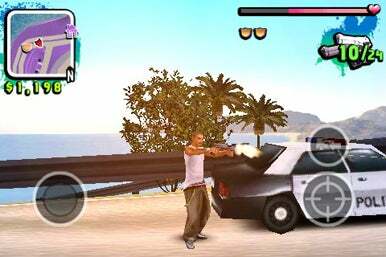 Guns A-Blazin’: With intuitive controls, detailed environments, and well-rendered characters, Gangstar: West Coast Hustle delivers a quality game that approaches what you might find on a console. The game’s premise delivers just what you would expect: you play a gangster who gets various jobs from his boss involving jacking cars, making “special deliveries,” whacking people, and so on. As you complete jobs, more of the main character’s storyline is revealed, complete with flashbacks to a stint in the big house. The whole story is a little over the top but nevertheless adds to the experience. In addition to the main missions, you can perform lots of mini-missions, like delivering food or driving a taxi. The game also offers achievements that you can unlock by doing things such as running over a certain amount of people. Essentially, there’s nothing new or innovative to the genre in Gangstar. Then again, that’s not necessarily the goal. What Gangstar does is deliver the GTA experience to the iPhone in impressive fashion. If you’re tired of doing jobs and need to blow off a little steam, you can just go on a rampage terrorizing the city in classic GTA style. The more mayhem you spread, the higher your wanted level goes up. One of the most fun aspects of GTA involves tons of cops chasing you; unfortunately, in Gangstar there’s not much difference between the lowest and highest wanted levels. Sure, more cops come after you at the higher levels, but you won’t find insane chases involving tanks, swat teams, and helicopters. Even still, there’s much fun to be had wreaking havoc on the city while evading the law. Gangstar features a sprawling city, completely rendered in 3D to great detail, for you to explore. Scattered throughout the city are several gun shops where you can purchase the best weapons as well as auto repair shops to fix up your busted ride. I can’t really see spending my hard-earned cash on auto repairs when I can just steal a new car, but the option is there if that’s what you want to do. Graphically, Gangstar is far ahead of most other games on the iPhone with its finely detailed environment and well-rendered characters. Gameloft has really pushed the envelope on what the iPhone and iPod touch are capable of, but not without some consequences. If you’re playing on a first-generation device, you may experience some lagging and freezing if something is running in the background. Also, there is a lengthy initial load time of up to one minute, depending on your particular device, but beyond that, the game runs pretty smoothly. Gangstar’s controls are both intuitive and responsive. While on foot, you have a virtual D-Pad on the left and an action button on the right. To cycle through your different weapons, you tap an icon in the upper right side of the screen. Once you’ve selected your weapon of choice, you tap on a victim to target them so there’s no need to aim. Jacking a car is as easy as tapping a pop-up icon. Once you’re behind the wheel, you can choose between three different control schemes—tilt steering with gas and brake pedals, a steering wheel and pedals, or two sliders for both. Each of these options worked well. As you drive around, you can listen to several radio stations complete with colorful DJs and some cool music. Gangstar is a truly impressive game that’s well worth its $7 price tag. If you have a first generation device, be prepared to have to do a restart before playing each time to ensure smooth gameplay.